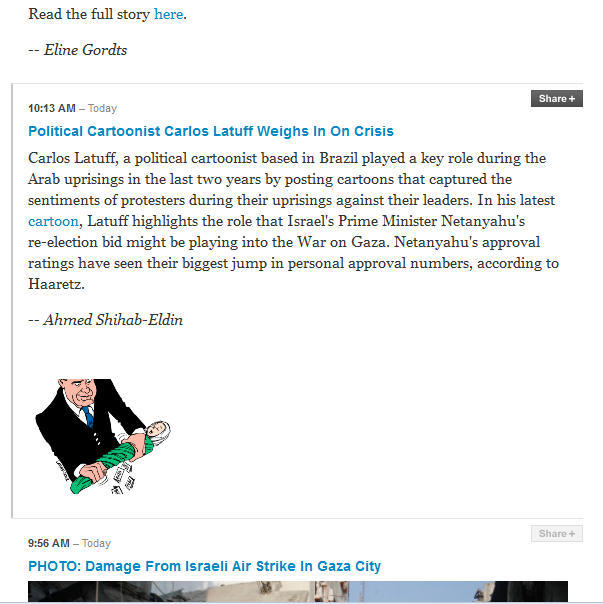 The Huffington Post, allegedly a mainstream, balanced news media outlet, has covered and promoted the work of anti-Semitic cartoonist Carlos Latuff. The Huffington Post, its editors, and its owner, Arianna Huffington, have created a safe, welcoming space for all manner of Jew haters to spread their rhetoric and ideas. In case you can’t see the cartoon clearly enough, here’s a link to it. It’s a cartoon of Israeli PM Netanyahu wringing votes for himself out of a (presumably Palestinian) baby, a modern twist on the classic blood libel against Jews. The Huffington Post and its reporter that published this story, Ahmed Shihab-Eldin, seem to have no problem with this anti-Semitic cartoon, publishing it with no condemnation and in fact support, with Shihab-Eldin claiming Ha’aretz reported Netanyahu’s approval ratings have increased. There is no other explanation for the decision to publish this news story other than the Huffington Post considers Latuff’s hateful cartoons to be legitimate political opinions that not only belong in mainstream discourse, but worthy of the Huffington Post’s readerships’ attention. Why is the Huffington Post publishing the hate filled rants of anti-Semites as if it is respectable, news worthy opinions? I’m sure we all remember another cartoon on that theme a few years ago in The Independent, showing Sharon EATING Palestinian babies. That cartoon went on to win the 2003 Political Cartoon of the Year award. Himel: My question to you is, why, in all these [images] don’t we see Sharon and Arafat eating babies? Carlos Latuff is an inflammatory windbag. Mixed metaphor? Who cares. The man is a scumbag. Don’t you feel that the Huffington Post’s publishing this is unacceptable? Where are the comments on Rupert Murdoch’s anti-semitic tweets? Because they no longer fear the false allegations of anti-Semitism and because the paradigm has shifted and Israel only has the support of a minority of US jews. Your Livingstone manouvre won´t work, buddy. Quit hiding your Jew-hatred with this pathetic façada of self-righteous moral paragon. Your masquerade is pathetic. You are helping spread anti-Semitism, so you won the Juliius Streicher Award. Again making a claim that’s false as well as noxious. Alex, is it the same truth as the one written in Mein Kampf? And speaking of Truths Alex, when will you get out of your political closet? What credibility now for the Huffington Post?? I’m always amazed by the contempt for democracy of those who accused Thatcher and Bush of the same thing. Why don’t they ask why Hamas decided to escalate violence so close to an Israeli election? The cartoon depicts a current truth, C’est tout. Could you explain what that is? Be specific, because we love exposing anti-Semites, such as yourself. Do you even know what truth is? Verite, in case you are a Franco lingo. Here, another one whose nick is a “meaningless name which is not part of language at all”. Philosophaster-in-chief, aka “realzionist” is creating his own tribe. Thanks for the coverage CifWatch. The Algemeiner picked up this story, and I think we have you to thank for it. Hopefully the Huffington post will be taking some hits over this.